When Frank Bale was a lawyer, he wore Savile Row suits. Now he has holes in his trousers and serves papers for other, successful, lawyers. Life is bleak but he is kept going by a Philip Marlowe obsession and a longing to prove himself. When a student winds up dead, he gets the chance to investigate a real crime, relying on advice found in an old ‘Tradecraft Manual’ and the sayings of his nan. But neither the manual nor his nan nor Marlowe prepare him for handling the slimiest of London’s underbelly, jellyfish, who hit back first with fists, then with golf clubs and finally with guns. Can Frank stay alive long enough to find the killer – and get the girl? What a pleasure it has been reading and listening to this novel with it’s off the chuff dry humour that makes up down trodden P.I. Frank Bale. Loved this character that just didn’t know when to keep his mouth shut when he needed to. Which in turn resulted in him receiving more than one beating, with each hit still causing his mouth to keep motoring on. I just laughed throughout the whole story. What Frank lacks in experience he makes up for in determination but he is so easily distracted by a pretty woman. What should have been a quick knock on the door and serve divorce papers to Mrs Madeleine Knights would lead to her hiring Frank to dig the dirt on her husband, so she could contest his claim to the family home and custody of their daughter. Now Frank needs to pay the rent so conflict of interest doesn’t really occur to him. A few quick photos of Nicholas Knights with some sleazy woman should do the trick. Shouldn’t it? Well perhaps not when Frank wakens up with the said sleazy woman dead on a back street and him a with a battering he could have done without. You should never judge people on your first impression as Frank discovers. Not only was I thoroughly entertained by Frank’s constant one liners but this is a brilliant story to go along with it. With Frank’s Philip Marlowe obsession and bible bashing quotes this ex solicitor makes for a pretty awesome P.I. There are so many classic gems in this book that really does steal the show. I am so looking forward to more from this author after such a super debut novel. Lev D. Lewis was born, raised and writes in London, England. Like Frank, he was once a promising solicitor. Unlike Frank, he has never worked as a private eye, not even as a process server. 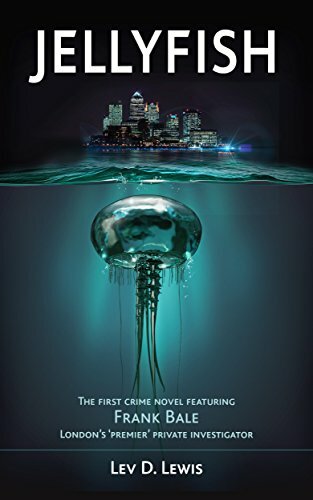 Jellyfish is his first novel. Red Hair (working title), in which Frank achieves his dream of having an office – actually, it’s a disused tattoo parlour that he moves into, at the landlord’s request, to prevent squatters from doing the same. He vainly hopes that it will lead to an increase in the number and importance of his cases. It will be published towards the end of 2017.